Jiang was back in the meadow were Jiang and Taoxin found this secret meadow. He sighed. "Don't know what to do." Jiang said sadly. He looked around the meadow. The Quarter moon is shining do brightly. Fireflies flying about all around. The environment really looks blue. Jiang feels so blue. Confused and sad fills his mind right now. Loneliness fills his heart so quickly. Jiang thought as he continued to think nothingness..trapped in the nothingness. Zhandouji was wandering around, he had escaped home and his bed. He wanted to run around, free in the night air. Soon, he had lost all sense of direction, having no idea where he was. As he wandered, he took in the sounds, smells, and sights of the nighttime. Zhan couldn't help but smile. After hours of wandering, he saw a meadow, and a person in the meadow. Zhan walked towards him calmly, and carefully. When he got close enough, he could tell this guy wasn't a bad guy, he could just tell. "What are you doing out so late, mister?" Zhan asked in a near whisper, so the other could just barely hear him. Jiang continued to sang the song - ♪ ♫ Lonely is the Night ♫ ♪ by Air Supply. Then he heard something, cracking noises, footsteps. Someone is approaching but he didn't care, when iit/he/she is something/someone bad, Jiang we'll just use his skills to them. He just didn't feel okay today. Its like he feels so badly that he felt so numb. "What are you doing out so late, mister?" A Male voice said. Then Someone appeared out of nowhere. A Tall Man, with short length hair, a serious smile is painted in his face. "Oh! I'm sorry, Is there something I could do for you?" Jiang said as he studied the guy's appearance. When he always meet a new person, he studies the person's face, and the appearance, cause for him it is a factor to know the person's attitude. "No, I didn't mean to bother you or anything, I just thought it was weird for someone to be out so late all alone." Zhan said, keeping a smile. He seems to be acting weird, or maybe he's just a weird guy! Zhan thought innocently. "Can I sit by you?" He asked. Without waiting for an answer, he plopped down on the ground near the guy. "My name is Zhandouji by the way!" Zhan added, feeling lighthearted and innocent as ever. The boy was naive, but kind. I wonder if other people think I'm weird, like I think they are sometimes... He thought. But, I am pretty cool, so maybe not!! "Oh! 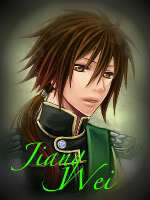 I'm Jiang..." Jiang said as he sat down on the ground looking at the blue sky wandering now at night. "How long have you been there? Are you lost?" Cause nobody but me and my friend knows this place." Jiang said as he smiled at Zhan. Last Time over a thousand years ago, Jiang and his friend, found this meadow along the borders of china and now the meadow seems more beautiful than ever, its amazing that this meadow keeps getting stronger over the past few years. Zhan nodded. "Yeah, I was wandering around, trying to get away from home for a while. I never get any time to just have fun there, if I'm not studying, I'm training, if I'm not training, I'm asleep or I'm eating. It's no fun..." He said, sighing as he let out his frustration. "But, they're just trying to keep me safe I guess." He added. I just wish I had more free time to do what I want. He thought wishfully. It was something that seemed like it would never happen, but Zhan hoped it would one day soon. Maybe he'd have some time to himself soon, without having to run off in the dead of night. He looked at Zhan, curious of what Zhan is thinking. Somehow Jiang understands Zhan's situation. Training, Studying, Sleeping and Eating, Whoa! Jiang thought. "You're life is great Zhan!" Jiang said in amazement. "Train, Study, Sleep, plus EATING!!!" Jiang added for eating is what he likes the most besides flying around China. "Who are you really? Its like you're a prince or something." Jiang asked for its sounds like Zhan came from a rich family.